If you aren't caught up on the most recent season of Game of Thrones, BE WARNED! There's gonna be BIG OL' SPOILERS IN THIS POST!! We need to talk about the original Lord Commander. Yes, I am referring to the Night King - or rather the THEORY that the Night King was once not only Lord Commander of the Night's Watch - but a full blooded Stark himself. And what does that have to do with buttered turnips, you might ask? We already know that the Night King has breached the Wall, so it's inevitable that he'll soon be making his way to Winterfell to fight the Starks and reclaim the lands of the living for himself. What the Night King actually wants - and why the White Walkers returned at all - is a mystery that I'm positive will be revealed to us in the final season. Jon Snow technically gave up his right as Lord Commander of the Wall when he reclaimed Winterfell, officially becoming the King of the North. He, as well as anyone, knows that the White Walkers will be next to impossible to stop unless he has a strong army to back him. Whether you are supping at the Wall or at Winterfell, you can almost be assured that buttered turnips will be on the menu. They are as tasty as they are easy to cook - and Lord Commander knows, the easier the meal to prep, the faster his men can be fed, the stronger the army against the Night King. Regardless if you believe that the ORIGINAL Lord Commander of the Wall is the Night King - or Bran - or Jon - or whoever tf will step up to the plate next, you can be assured that buttered turnips will always be on the menu at the Wall. MORE GAME OF THRONES RECIPES ARE COMING! Check back tomorrow for more GoT themed recipes! 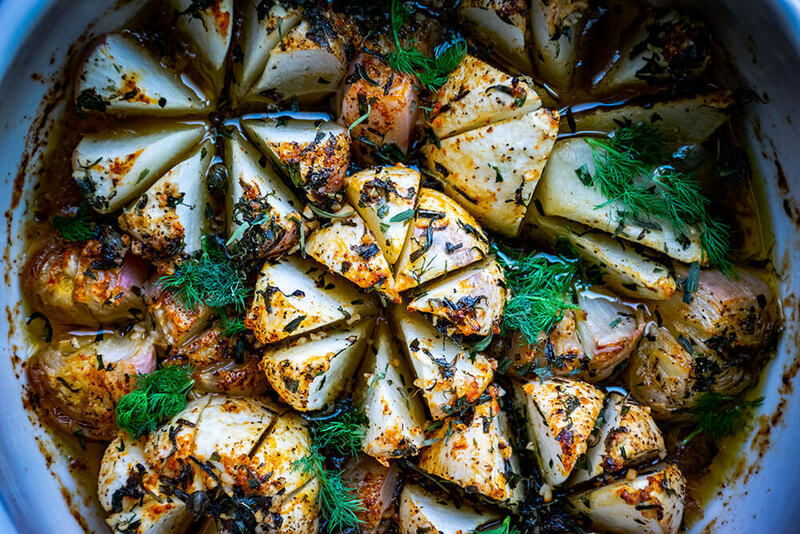 This recipe was inspired by and modified from the recipe for Buttered Turnips in the Unofficial Game of Thrones Cookbook. Wash the turnips of any dirt. Remove the tips flat, but do not skin the entire turnip. Place the turnip in the bottom of a wooden spoon, cut side down, and use a sharp knife to cut diagonal slices into the turnip to create triagle pieces. Do not cut all the way through the turnip - they should still be connected on the bottom (the spoon will help to not cut all the way through). Remove the paperly skin and tips from the shallots. Use the above method to slice the shallots - their bottoms should still be connected. 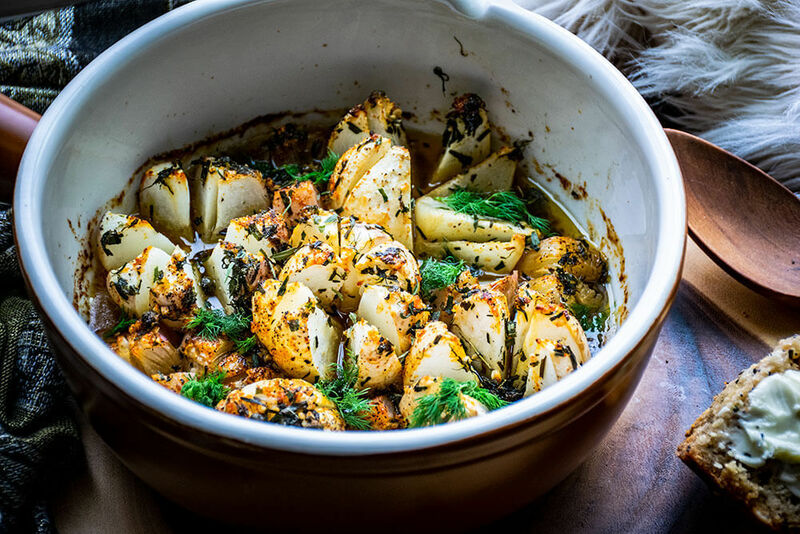 Preheat the oven to 375 F. In a small bowl, whisk together the melted butter, tarragon, garlic, capers dill, sugar and olive oil. Set aside. 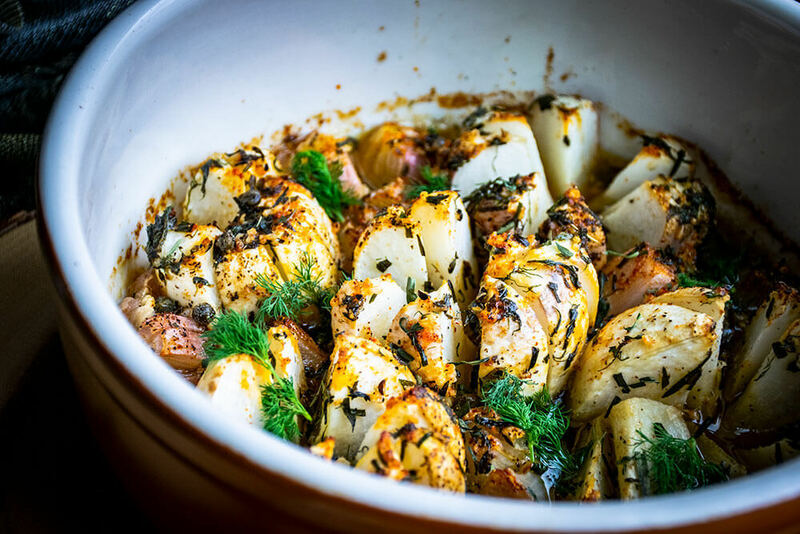 Arrange the shallots and turnips in the bottom of a heavy oven safe pot. Pour the butter sauce over the turnips, making sure to get it in the crevices of the turnips and shallots. Dot the tops of each turnip with a pat of butter. 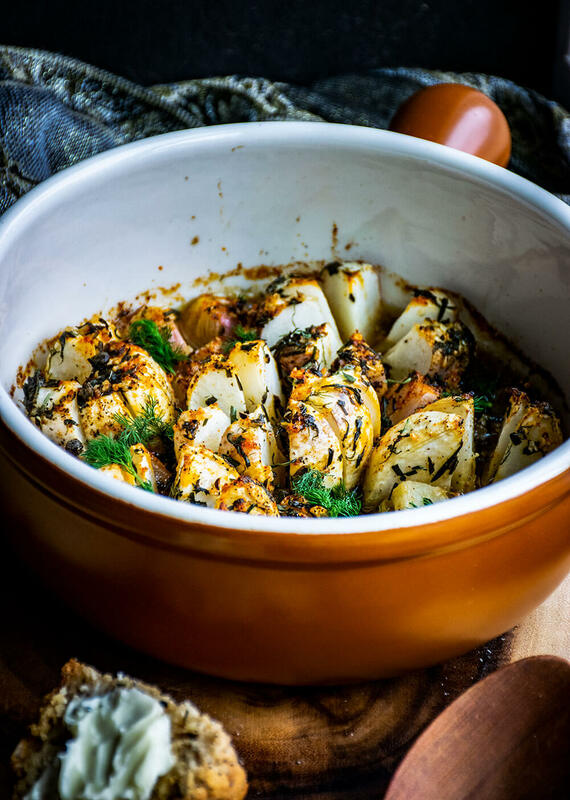 Sprinkle the smoked paprika across the tops of the turnips and shallots. Drizzle with olive oil. Season with cracked black pepper. 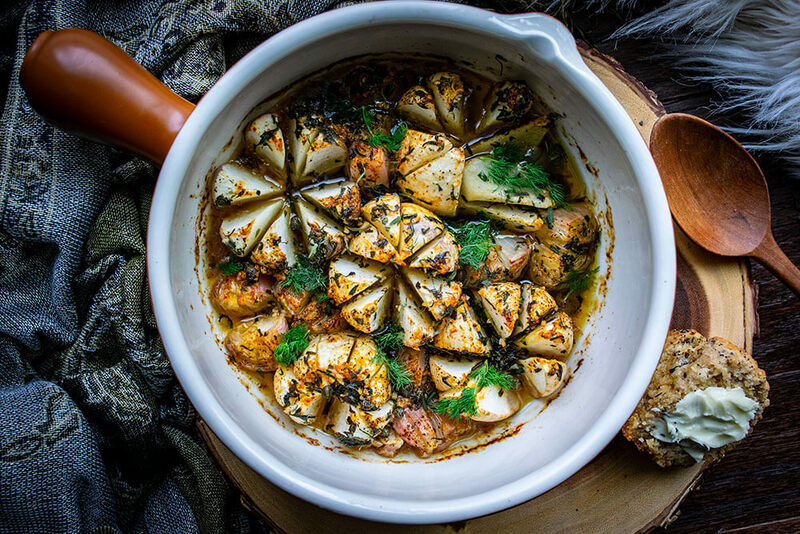 Bake for an hour and a half to two hours - until the turnips are tender and golden on top. They should pierce easily with a fork. Enjoy with honeyed chicken at the Wall.